Whenever I do a new livestream on Instagram (hint hint, @universetoday on Instagram), it’s generally with an audience that doesn’t have a lot of experience with my work here on Universe Today or YouTube. They’re enthusiastic about space, but they haven’t been exposed to a lot of the modern ideas about astrobiology and the search for extraterrestrials. They have, however, seen a lot of TV and movies. That’s actually a more complicated question. On the one hand, the question could be: do I believe that aliens are visiting Earth, creating crop circles, infiltrating our government, and experimenting on human/alien hybrids for the eventual overthrow of human civilization? The answer to that question, is no. I believe in UFOs, in that, I believe there are unidentified objects flying in the air, which haven’t gotten a definitive categorization. And when they do get an explanation, it’s weather balloons, or Venus, or airplanes, or fireworks, or drones, or a hoax. Because if it was aliens, we would have some kind of evidence. There would be something, anything, that gave definitive proof that aliens were here. What I’m talking about is some kind of monument, or machine, or vehicle, or factory. Something that’s been around here on Earth for as long as human history, and has no explanation for how it could have been created. UFO researchers point to things like the pyramids, or the statues on Easter Island, or the Nazca lines, when there’s plenty of evidence these things could be created by humans and their tools of the age. Even when the hoaxers who created crop circles with a plank on a rope and a little planning tried to explain how they did it, people didn’t really believe them. I want to show you a series of amazing visualizations created by Sam Monfort, a data researcher in the Human Factors and Applied Cognition program at George Mason University. Sam pulled in data from the National UFO Reporting Center or NUFORC which has been collecting reports all the way back to 1905. Since its inception, NUFORC has received almost 105,000 UFO reports. And sighting are at an all time high. But what’s really fascinating is how the trends of what people see have changed over time. A century ago, the vast majority of UFOs were spheres or cigar shaped. But then saucers showed up in the 20s, and that’s all anyone saw. Cigars have dropped down to almost nothing, while lights in the sky have grown in prominence to become almost 50% of the UFOs that people see these days. Clearly spaceship design took a turn away from cigars, to saucers to glowing lights. Oh, fickle aliens spacecraft designers, following the latest fashions. The timing is interesting too. There’s a rise in sightings around July 4th in the US every year. Fireworks maybe? The other piece of data that’s pretty interesting is that people in the US are 300 times more likely to report a UFO sighting than any other country in the world. My own Canada is number 2. Here’s the thing. A huge percentage of the population is now carrying around their own personal tricorder, which will record audio, video and take amazing pictures, even in a dimly lit alien spaceship. And yet, there still hasn’t been any definitive, scientifically proven evidence for aliens. Google is watching everywhere I go, and reminds me that I visited Home Depot last week, but you think the occasional trip to an orbital research facility would get picked up. I feel pretty confident when I say, there’s no evidence that aliens are visiting Earth. But the deeper question is a little more unsettling. Do I believe there are aliens in the Universe? The observable – or inferrable universe. This may just be a small component of the whole ball game. The Universe is huge. 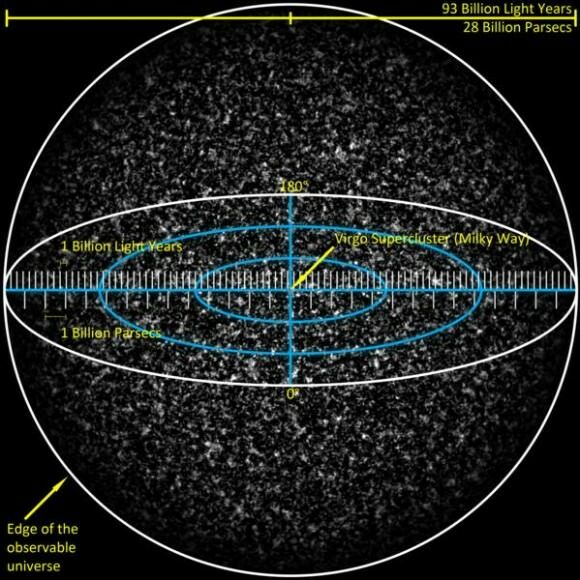 The very edge of the Universe we can see is known as the observable Universe. The first light in the Universe has been traveling through space for 13.8 billion years to reach our eyes. And because of the expansion of the Universe, those regions are now more than 46 billion light years away from us. That’s just the observable Universe. The actual physical Universe is much larger. Hundreds of billions, trillions, quadrillions or more light years across. Maybe it’s even infinite. Forever is a long way. And we know that the Universe is old. It’s been around for 13.8 billion years. Our Milky Way has been around for almost that entire period. The Solar System showed up a relatively recent 4.5 billion years ago. We’re late to a party that’s been raging for almost 10 billion years already. Fossil evidence tells us that life formed here on Earth pretty much as quickly as it was possible to do so. Just a few hundred million years after the Earth formed, and it wasn’t entirely a ball of molten rock, life popped up and started evolving. Multiply the Universe’s age by its size and you get a place that really should be teeming with life, and yet we don’t see any evidence of aliens. Not in cigars nor saucers. This is of course, the Fermi Paradox, and we’ve talked about this several times in the past. We can’t seem to find evidence of aliens, or their robotic spacecraft which should be busily colonizing the Milky Way turning every planet they reach into more robots. The Fermi Paradox has been the source of arguments and existential terror for many. In fact, if the Fermi Paradox doesn’t bother you in an existential way, then I don’t think you’ve thought about the Fermi Paradox enough. Are there aliens? There might be single-celled, simple organisms across the Universe. But more complex animals like we have here on Earth might be incredibly uncommon. This is the idea of the Rare Earth hypothesis, which was put forward in the year 2000 in a book by paleontologist Peter Ward and astrobiologist Donald Brownlee. If you have any interest in this subject, I highly recommend you give it a read. In Rare Earth, Ward and Brownlee argue that Earth was lucky in many factors that we never really thought about before. The Earth is the right distance from the center of the Milky Way so we’re not bombarded by radiation, but not too far so that we’re in the outskirts, with no heavy elements. We orbit the right kind of star, and the right configuration of other planets in the Solar System. No big bully super-Jupiters that caused havoc with our planet or kicked us out of the Solar System entirely. The orbit of the Earth has been stable for a long time, following a roughly circular orbit around the Sun. Our planet is the right size and density for life to survive and thrive. With plate tectonics, which help recycle our rocks and atmospheric gasses, so we don’t become a hellworld like Venus. With a single large Moon that helped regulate our tides and provided an environment where some lifeforms could have been forced to find a better way. And then some kind of secret sauce that helped give Earth life the kick it needed to go from simple to complex lifeforms. Maybe there’s life everywhere, but we’ll never find anything more complex than bacteria. Or maybe we’ll never find anything anywhere. Ever. A bright Taurid meteor falls over Deadfall Basin, near the base of Mount Eddy in California. Credit and copyright: Brad Goldpaint. I understand why the search for UFOs is so fascinating for people, and why many think that’s a reasonable default answer for seeing glowing lights in the sky. But for me, I want to know for sure that we’re not alone, that there are other aliens lifeforms and maybe even civilizations out there among the stars. I don’t believe UFOs are aliens, and I’m not entirely convinced there’s anyone else in the entire Universe. And that’s why I think we should dedicate ourselves to finding out the answer. Listen to stars for signals from extraterrestrial civilizations, search planets for the chemical signatures of alien life. Scour our own Solar System for anything. Under the rocks on Mars or under the oceans of Europa. If it does turn out that we’re alone? What then? Do we have a greater responsibility to take care of ourselves and our planet, to make sure the candlelight of life and intelligence doesn’t flicker out? Now you know how I feel about aliens, what about you? Do you think we’re being visited on a regular basis? Do you think there are aliens out there, somewhere, waiting to be discovered? Or do you think we’re all alone in the Universe. I’d like to know your thoughts. In our next episode, we’re going to talk about one of the biggest current mysteries in astronomy: Fast Radio Bursts. They were only recently discovered, and they’re a total mystery. No answers next time, only questions. What would we do if aliens actually visited us here on Earth? How prepared are our governments to deal with them? It turns out, there are some specific plans and preparations, and I detail them in this video. The CIA has released a 355-page document which officially acknowledges that Area 51 in Nevada does exist, and the agency comes clean about their weather balloon cover stories. The document covers the U-2 and SR-71 spyplane programs and Project OXCART, the aerial reconnaissance programs, from 1954 to 1974. Nope, no revelations about extraterrestrial spacecraft or alien bodies hidden at the base, but a really grainy map showing the location of Area 51 is included. While Area 51 has been the subject of fascination for conspiracy theorists and paranormal enthusiasts — and is entrenched in UFO-ology and pop culture — the newly declassified information (with surprisingly few redactions) admits the base was a top-secret aircraft testing facility for Cold War reconnaissance of the Soviet Union. High-altitude testing of the U-2 soon led to an unexpected side effect-a tremendous increase in reports of unidentified flying objects (UFOs). In the mid-1950s, most commercial airliners flew at altitudes between 10,000 and 20,000 feet and military aircraft like the B-47s and B-57s operated at altitudes below 40,000 feet. Consequently once U-2s started flying at altitudes above 60,000 feet, air-traffic controllers began receiving increasing numbers of UFO reports. The document also explains Project Blue Book and other frequently associated UFO story staples. The job of Project Blue Book was actually to figure out when civilians were reporting UFOs that were actually U-2s and then work out how to keep that from happening again. Such reports were most prevalent in the early evening hours from pilots of airliners flying from east to west. When the sun dropped below the horizon of an airliner flying at 20,000 feet. the plane was in darkness. But, if a U-2 was airborne in the vicinity of the airliner at the same its horizon from an altitude of 60,000 feet was considerably more distant, and being so high in the sky, its silver wings would catch and reflect the ray of the sun and appear to the airliner pilot 40,000 feet below to be fiery objects. Even during the daylight hours, the silver bodies of the high-flying U-2s could catch the sun and cause reflections or glints that could be seen at lower altitudes and even on the ground. At this time, no one believed manned flight was possible above 60,000 feet, so no one expected to see an object so high in the sky. A handwritten document about the U-2 spyplane design that was included in the information released by the CIA about test flights and Area 51. But then, not all the UFO reports were explained by U-2 flights. Air Force investigators then attempted to explain such sightings by linking them to natural phenomena. BLUE BOOK investigators regularly called on the Agency’s Project Staff in Washington to check reported UFO sightings against U-2 flight logs. This enabled the investigators to eliminate the majority of the UFO reports, although they could not reveal to the letter writers the true cause of the UFO sightings. U-2 and later OXCART flights accounted for more than one-half of all UFO reports during the late 1950s and most of the 1960s. In the document, the CIA admits the weather balloon stuff was just a cover story, but it was the standard operating procedure for how to explain away the sightings as well as debris from any crashes. However, this cover story ended up having disastrous results in May of 1960 when the crash of a U-2 in Russia and the subsequent capture of pilot Gary Powers set in motion a pattern of mistrust between the US and USSR that culminated in the Cuban Missile Crisis in 1962. After the plane and the pilot went missing, and with the fate of the plane and pilot unknown, the CIA had NASA release a statement that they had a weather airplane that went off course over the Soviet Union because the pilot had passed out due to a loss of oxygen. That story was quickly proven to be a hoax when the USSR produced the crashed U-2 plane and the pilot, who survived the crash and who had admitted to spying. The documents were released in response to a Freedom of Information Act request submitted in 2005 by Jeffrey T. Richelson, a senior fellow at the National Security Archives. Originally, the CIA had released a heavily redacted document with all mention of Area 51 blacked out. This new document reveals pretty much everything except names of military personnel and private citizens involved. Richelson has pointed out that the location of Area 51 was not a particularly well-kept secret. Its location appears in satellite imagery like Google Maps and Google Earth, as well as in books on aerial surveillance. You can wade through the 355 page document here. If you enjoy military and aircraft history, its a great read. One interesting fact revealed is that President Eisenhower wanted the pilots of these planes to be non-US citizens. “It was his belief that, should a U-2 come down in hostile territory, it would be much easier for the United States to deny any responsibility for the activity if the pilot was not an American,” the document reports.